We are a leading Manufacturer & Exporter of Tower and Ladders Repairing Services such as Aluminium Ladder Repair & Services, Mobile Tower Ladder Repair & Services and Aluminium Tower Ladder Service from India. 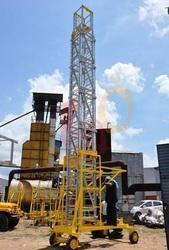 A flourishing enterprise in this domain, engaged in presenting a wide range of Aluminum Tiltable Tower Ladder. These ladders are manufactured utilizing quality aluminium alloy and latest techniques. The offered ladders come with platform system where the user can stand and execute the task. The whole ladders are built and designed adhering to industry standards so that perfect balance and accuracy can be guaranteed. Besides, clients can get the ladders from us at cost effective rates. 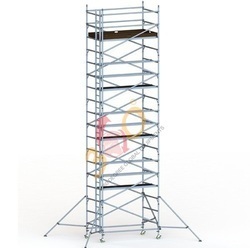 We are offering aluminum mobile scaffold standard tower that is manufactured using simple cup lock scaffolding. These towers are manufactured using high grade alloy, which makes these highly functional and durable. The aluminum scaffold have been designed and constructed in a manner that maximizes their strength and have been rated medium duty. 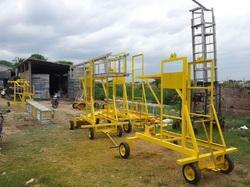 These ladders have special mobile platform, which can be used accordingly as per the requirement of users. 1. H-Frames : Each H frames of 2 meters Height with spigot made-up of 50 mm dia Aluminium Alloy round pipes are connected with ‘T’ joints fully Aluminium welded. For maximum strength and durability. 2. Brasses Horizontal Diagonal : Self auto locking snap braces spring loaded horizontally and diagonally fully Aluminium welded for maximum strength and durability. 3. Working Platform : Working platform made up of Aluminium Alloy rectangular sections fitted with side claws hook, lifting ring and trapdoor systems. fitted with Aluminium chequered plate (sheet)fully welded. It can placed at any required height. 4.Adjustable Outrigger : Adjustable outrigger (stabilizers) Spring loaded with handle adjustment can be connect to the structure of freestanding scaffolding towers fitted with clamps and rubber bungs. 5. Castor Wheel’s : Breakable castor wheels heavy duty with a load rating of 900 Kgs. With 12 inches adjustment for an even areas like steps, staircase and sloping rungs. 6. Staircase Ladder : Internal staircase ladder with flat non slip corrugated steps fitted with clamps and adjustable winged for easy access. Apart from sale and rental we are give Repair & Services for Aluminium Tower Ladder Service in chennai. We have been doing this in Tamilnadu, Kerala, Andhrapradesh, Karnataka. The average ladder can be repaired for about half the cost of a replacement product. We offer professional repair & service for most of the aluminium ladders. We can also straighten most aluminum extension ladders that become bent. The average ladder can be repaired for about half the cost of a replacement product. We offer professional repair & service for most of the aluminium ladders. We can also straighten most aluminum extension ladders that become bent. Looking for Tower and Ladders Repairing Services ?